A round pupil means it’s a grass snake and not an Adder. 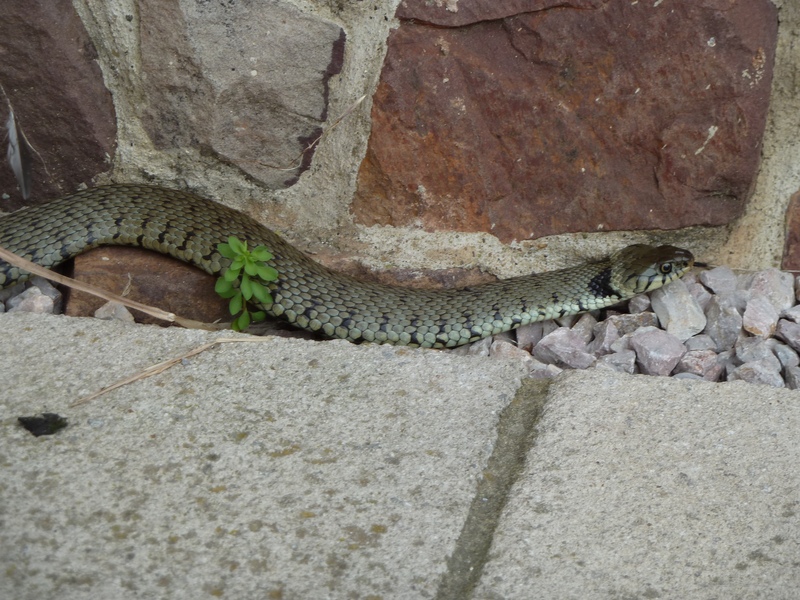 …and then it slithered off and vanished down a hole in the side of my house; I was a little perturbed by this…. so much so that I gave a little gasp. This entry was posted in Personal on August 1, 2013 by Ms Quotes. I save the screaming and flapping about for when I see a hornet… somehow I can’t envisage a picture of one of those turning up on this blog! Oh, no need to be perturbed. Mr/Ms Snake is there for rodent control! I would have grabbed my marigolds and a net and placed an ad on Preloved Pets. This is why I like snakes much better than hornets… nobody would want to buy a hornet. Not poisonous, Princess. We only have three types of snake in the UK, the grass snake, adder and slow worm. If I see an adder I will take the photo further away and do the zoom thing… or I may just edge away slowly and not bother with a pic. 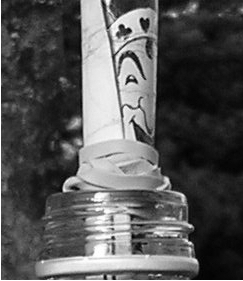 I would love to have a ssssnake pop in for a cuppa, they could even have my one Royal Wedding cup. Sadly we only have skunks who stink up our dog and moles who make a mess of our lawn. I don’t fancy finding a skunk on my patio! But earlier in the year I saw a weasel out there… which instead of running away when it saw me, ran straight towards me. I wish I’d had my camera with me then. I could have also blogged about the baby owl, the roe deer and the lizard… it all goes on out there. I think I may still have some pictures of the dogs from the local hunt, which I intended to blog about ages ago, I will see if I can find them. Where I grew up in Southeast Texas, most of the snakes one saw were venomous. There were various rattlesnakes, very aggressive water moccasins, copperheads, and the occasional coral snake. This is why I am grateful to live in the UK! Adders can kill, but it’s rare… and I bet your hornets are twice the size of ours as well, which would put me in a frantic flappy fit… or, I would be permanently armed with some sort of deathly insecticide. I would be squirt happy with it. Oh, here you are! 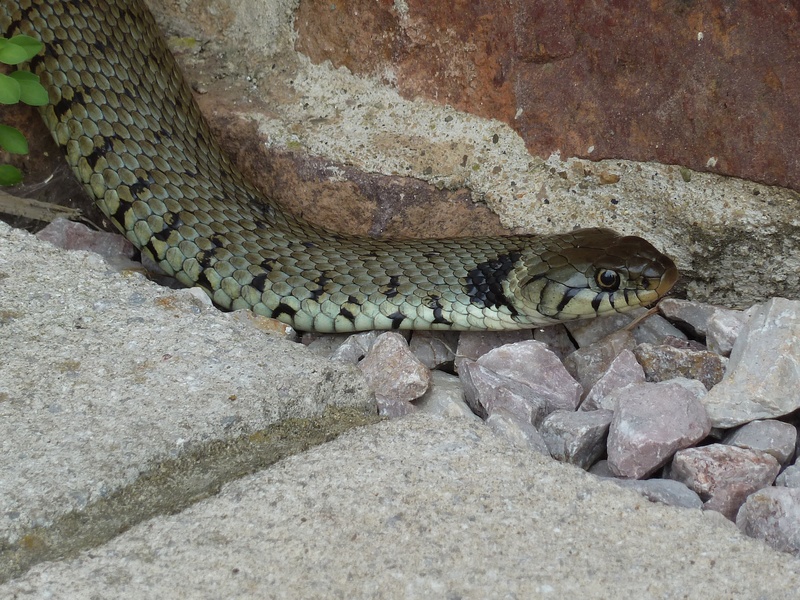 Cavorting with grass snakes – I should have known. I can’t wait to see what else your paysho provides for us. I won’t show you my plant pots, Mr Devine… you would recoil in horror! Oh! such entertainment on your patio! All the years I lived there I only ever saw one snake – an adder.On Hampstead Heath.And you have the local hunt there, too? I will see if the hunt pictures are still on the camera… they are quite funny. Dogs everywhere… the foxes laughing from quite a distance…. Draw no metaphor from a snake crossing your path! It’s hard to tell how big he was. Next time, can you set a pound note next to him for scale? He was quite a big one for England! But I see your point… I will have a tenner at the ready next time. Lucky you, I never see anything like that around here, though I’m told they exist. The Mr was bitten by an adder once, and had to be taken by helicopter to Glasgow Royal Infirmary, and miss the party he’d gone to the Western Isles for. I think my poor old cat was bitten on the ear once. I managed to get all the pus out, but she never wanted to jump around in the long grass again, the experience made her fearful of going out and she became almost housebound. I’m charmed by this new series. Since you showed me yours, I’ll show you mine. Unfortunately, I never have my camera ready when he visits but take a look at this! And then look at him up close and personal. They are so cute! I have seen some over here and spent time watching them… a long time ago… and I didn’t have a camera with me either! interesting patio – has a nice slither to it.